These notes are for parents and teachers, obviously the primary outcome is for our children to have fun whilst playing with science but all activities also link very closely to the curriculum which is just an added bonus! • Find paper plates, an egg box or alternatively you can use a burger box. • Tubing wide enough to go over the balloon pump, syringe or washing up bottle. 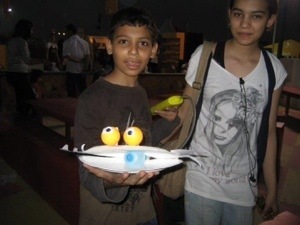 • Make some eyes or just glue on 2 ping pong balls for eyes. • Draw eyeballs with black pen. to make teeth. What else could it have in its mouth? • Glue the teeth on to your monster. • Paint or colour your monster; does it wear a hat? Have ears? . ▪ Put the balloon over the tube, secure it with masking tape if necessary. pass through or tape the end of the tube with the balloon attached to a paper plate and then staple another plate on top of it. • Attached the other end of the tube to the washing-up bottle, syringe or balloon pump. • Show them familiar objects that use air to make them work e.g. recorder, whistle, bicycle pump, balloon, inflatable swimming aids, foot pump for inflating an air bed, coiled party blowers, toys which use air. What does the air do? How has it been used in the design of these products? -What happens to the air when you squeeze the bottle? Or push in the pump? -What happens when you let go? Or stop pumping? -What happens if you put fabric over the balloon and then inflate the balloon? -Can you lift a book with the balloon? • Show them how balloon pumps or syringes can be used in conjunction with simple levers to control movement e.g. -place balloon in between 2 paper plates joined by staples to give a hinged section so that when inflated the plates separate – the basic set up for our monsters! • investigate ways of using their pneumatic systems with other materials to control movement. 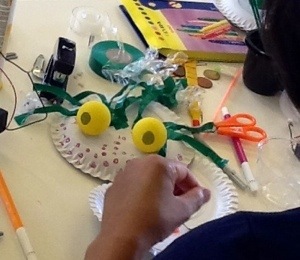 I would love to see the monsters you and your children create so please tweet them to ScientificSue or post them on my facebook page (www.facebook.com/scientificsue) so that all can see and enjoy how we use art to bring Science2Life.